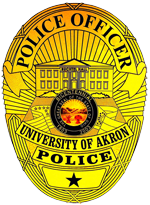 The Annual Safety Report is provided as part of The University of Akron's commitment to safety and security on campus and is in compliance with the Federal Crime Awareness Campus Security Act of 1990. The Police Activity Log provides information that may enhance your safety. Regardless of where you are, you can reduce the chance that you will need police assistance by taking sensible precautions and making informed decisions. See the Crime and Fire Log. The University sends advisories to encourage students and employees to take precautions and to submit any tips they may have. Previous advisories have prompted people to submit valuable tips that have led to arrests.